Bathroom remodel projects can be incredibly fun and rewarding — when you have the right products available to transform your bathroom from usable to incredible. 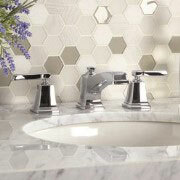 ProSource® of Richmond has bathroom sinks, faucets, showers, vanities, tubs, and toilets for your remodel. We can help you find the right sink for your bathroom. Depending on whether you want a modern or classic finish, we have pedestal, shroud, standard, vessel, and wading pool-type sinks available for your bathroom remodel. One of the first things people say after using a bathroom is whether or not there was a good shower. ProSource of Richmond can assist you in building an excellent shower, both in terms of look and function. 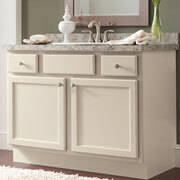 Vanities are one of the few storage options in a bathroom which make them a very useful feature. Our team can show you different vanity choices and help you find the right one for your project. When you visit our showroom, you will be able to see an array of bathtub options available, from traditional to luxury bathtub spas. 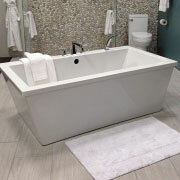 Tubs can be made from porcelain, fiberglass, marble, stone, and more! 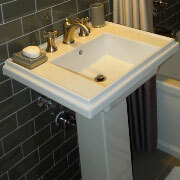 Additionally, we have tub faucets and hardware to go with the one you choose. 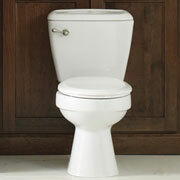 Toilets are a main focus on bathroom remodels for obvious reasons. If you and your client want more eco-friendly flush options or unique toilet features, you can browse a variety of toilet options at our showroom in Richmond!